Arguably the biggest AC/DC tribute band in the country, have announced two homecoming gigs in Blackpool. The AC/DC Experience consists of Darran Short (vocals), Andy Holt (lead guitar), Steven Wolf (bass), James Stringfellow (guitar) and Dennis Duxbury (drums) - with all four men hailing from Blackpool. 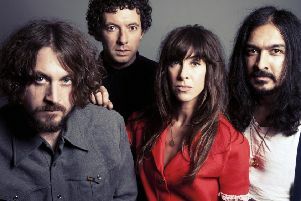 They will play The Marton Institute on Friday, March 10 and The Winter Gardens on Saturday, August 26 as part of the Great NW Motorbike Festival. The two Blackpool gigs are part of their 13-date 2017 UK Tour, which also sees them visit Islington, Manchester, Wolverhampton, Kendal, Oxford, Glasgow, Dunfermline, Bolton, Preston, Wigan and Newcastle. The band are aiming to delight rock fans young and old – many left devastated by reports AC/DC themselves may never tour again. The Anglo-Oz greats have lost four core members in the last two years, and founding lead guitarist Angus Young has raised question marks as to their future. Guitarist, James Stringfellow said: “What has happened to AC/DC over the last two years has been nothing short of heart-breaking. We are all massive fans. “As professional musicians and die-hard fans, it spurs us on to bring the true spirit of AC/DC to as many people as possible. “We absolutely bring the full AC/DC package both in terms of the music and the performance, and the response from audiences across the country has been fantastic. “Our vocalist Darran is rightly rated as among the best, able to sensationally deliver the signature vocal styles of both Bon Scott and Brian Johnson, while Andy is a mesmerising guitarist with the kind of licks and tricks Angus would be proud of! “In Wolfie, Den and myself we have an incendiary rhythm section that cannot be mistaken for anything other than the heartbeat of AC/DC. Tickets, priced from £10, can be bought in advance via www.acdc-experience.co.uk.